If you are looking for a secure and highly durable cart for your flat panel display then look no further then Balt 27532 height adjustable flat panel tv cart with cabinet. This flat panel tv cart comes with hideaway shelves that give users an additional space to put the items like laptop or any multimedia device. 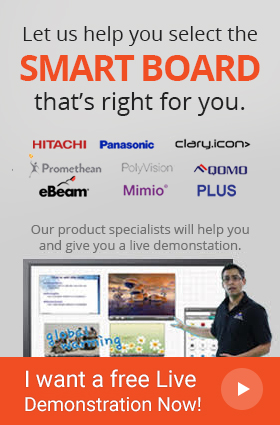 It provides all-in-one solution to manage the multimedia stuff with care and tidiness. The lockable cabinet is there to give users the safety and security of the valuable items. 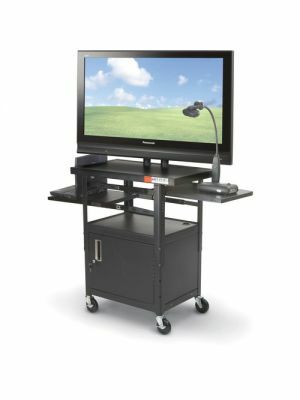 There are four casters that allow easy movement from one place to another and the two locking brakes make the flat panel tv cart stagnant while standing position. 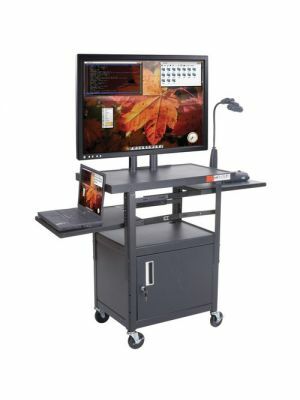 The 27532 flat panel cart offers cord management system and height adjustment, thanks to the innovative design of the twin posts. 24.0 x 18.0 x 46.0"